There was a time (circa 2000) when prices of denim jumped from $75 for a pair of jeans to $155 with Juicy Jeans and Diesel... then within a year or so, you had $200 pairs of Seven for All Mankind, Citizens of Humanity taking over the denim market. I only remember this too clearly because I worshipped denim, as I've laid out in my 'denimology' post. Now, the new standard 'regular' price bracket we are familiar with has loomed around $250-$300. The more embellished, the higher the retail price. Of course, there are the $500-$800 pairs of Dolce & Gabbana or Balmain jeans. Needless to say, I have not been keeping up with the denim pulse. Until today. I saw Jane Aldridge model a pair of Japanese-made Chimala jeans on her blog, Sea of Shoes. The distressed denim looks so cozy, soft, and lived-in- even in the photos. Great photography work or not, I was intrigued and looked the brand up. 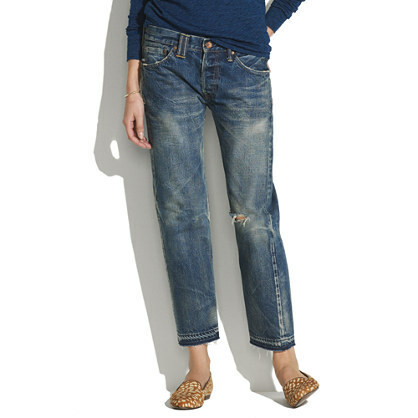 They are exclusively on Madewell.com and wow, they are pricey- $455 to $483 for a pair. By the website's product description the makers of these jeans have"turned expert fading and washing into an art form." My interpretation? Hole-y jeans to create major holes in your wallet! Yikes! I have trouble paying $100 for a pair of jeans!